Hey, this is the first game in this series where I actually saw the end of it! 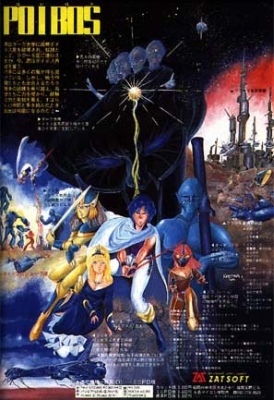 Mostly because it has almost no text, and what little is there is in English, as this is the first Action RPG, actually one of the very first Action RPGs from Japan. If the usual Japanese databases are to be believed, it was released the same month as Dragon Slayer, and one month before Hydlide. 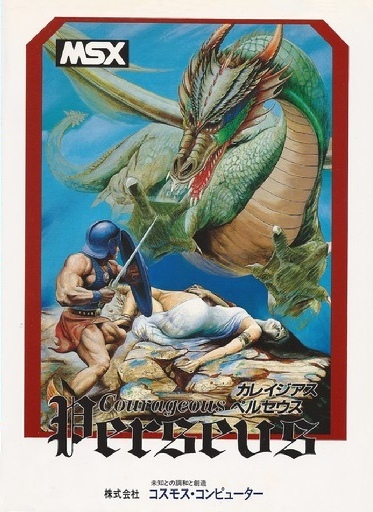 While the other two have spawned successful series and became two of the most revered CRPG names in Japan, Courageous Perseus has been mostly forgotten. 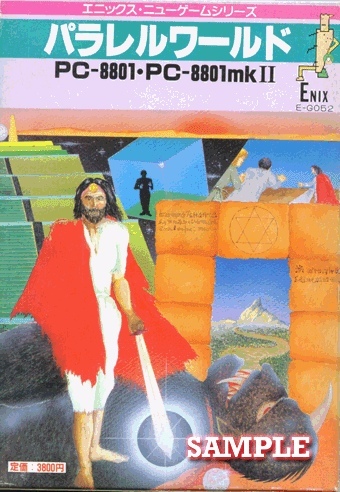 In its time, however, it seems to have been a pretty big deal, and publisher Cosmos Computer is said to have done a lot of marketing for the title. 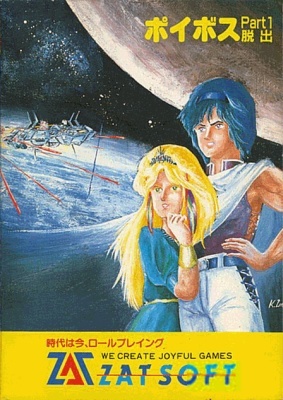 One of the staff members on Hydlide recalled how seeing an advertisement of Courageous Perseus had filled Hydlide designer Tokihiro Naitou with despair. In a way, Courageous Perseus is more advanced than its two contemporaries, but ultimately it may well be the worst of the lot. 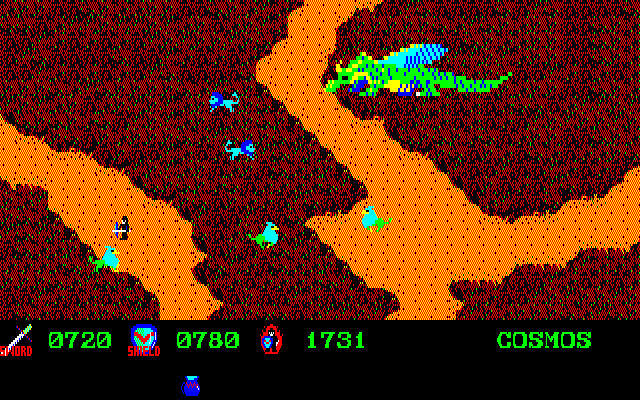 It starts out promising enough: As Perseus you get to steer a raft to land on an island full of mythical beasts. The task is to slay the dragon and save the girl, of course. There's no character creation, but at the beginning, we get to put in our birthday, for whatever reason. If you were born after the year 2000, you're out of luck, though. 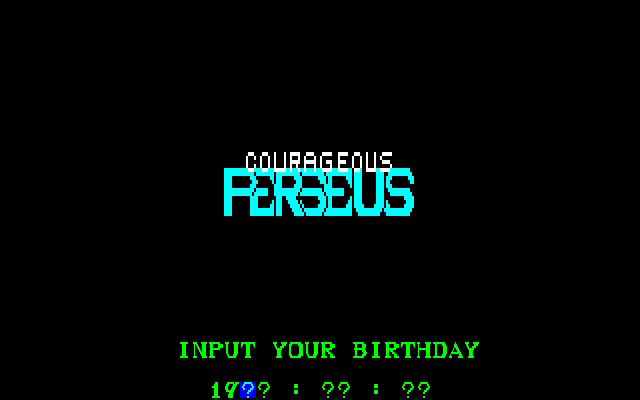 Perseus starts with 2000HP, but his health is constantly being drained one point per second. 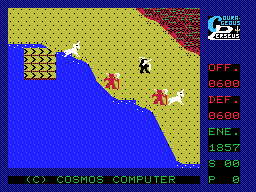 Enemies are attacked simply by bumping into them while holding the Space bar pressed. The problem: Almost all enemies are invincible to Perseus, at the beginning he can only kill the light blue soldiers and the unicorns. Every slain enemy raises his attack and defense values, though, and eventually gains the strength to try and kill a new enemy type. But the game never gives any hints as to which would be the next one, so it's all trial and error, often quite punishing as some enemies can consume hundreds of health points within seconds. Trying to find any rhyme or reason in the order, like determining which enemies "look" stronger, is futile. After the initial two, the next beatable enemies are the equally wimpy-looking Satyr, but after that come the Centaurs, which look more impressive than most of the others. Really the only way to survive is to find all these bells, but it's not always easy. For some of them Perseus has to use his raft - there is a lake in the middle of the island with another one - to reach some smaller isles. 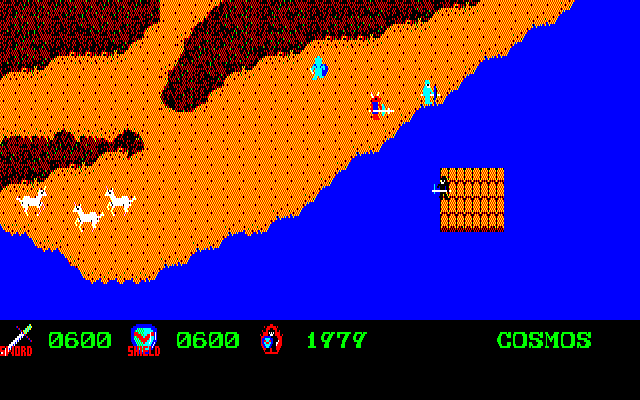 But giant crabs jump out of the water, and if the raft happens to be above them, that means instant game over. It's possible to swim really far out into the ocean, but there's nothing but sea monsters there. 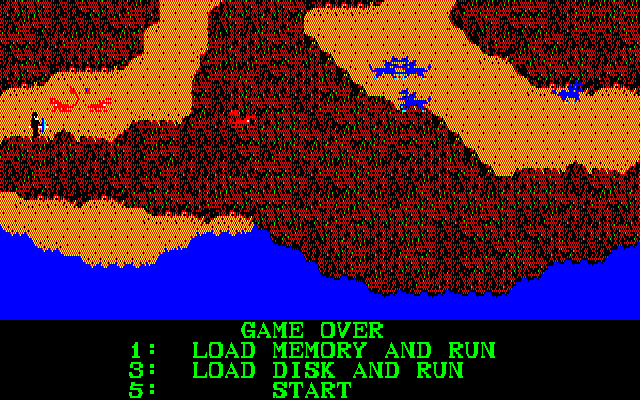 The island is filled with rocky mountains and thick woods that turn it into a maze, and the game is very good at showing you paths you cannot reach from your current location. Unfortunately, you usually have to drive your current target species near extinction before tackling the next one, which means a lot of confused backtracking over the island to find all of them. Enemies in general don't respawn, except some of them do. They're so few and it takes so long that it's not sustainable to try and grind for them, though. It's also kind of an eerie feeling to wander over the increasingly depopulated island. Makes you wonder if Perseus isn't the true villain here. Kinda surprising that he doesn't grow horns at the end. 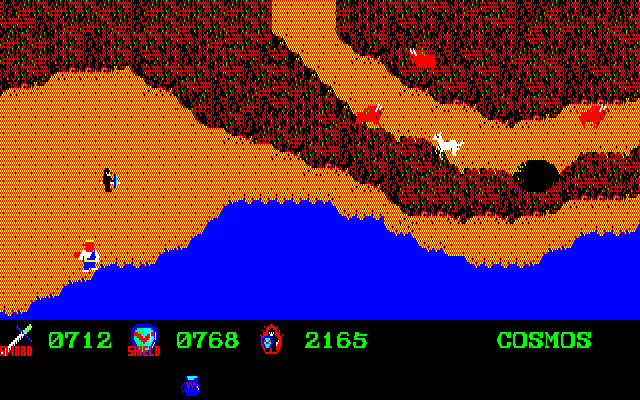 The caves make it possible to get around a bit faster, but where you come out is determined at random. 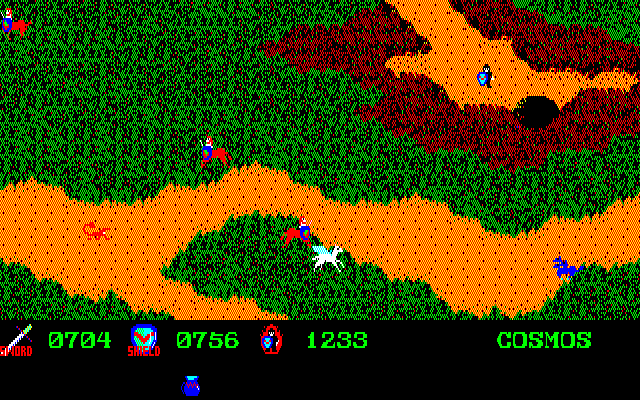 You also have to leave the screen once before you can re-enter, putting you in danger from the nearby enemies. Monsters move around randomly and haphazardly, but are often positioned to block your way, so it's not unusual to lose a lot of health while trying to find the one available prey. Even after learning the order of enemies, I had to cheat for a refreshment of health to have a chance at survival. Since Perseus is most famous for slaying the Medusa, she's also in this game. Getting close to her is enough to drain your health, but once Perseus is strong enough, she is slain just like any other enemy. The dragon is actually the most peaceful creature on the entire island. It just sits on its mountain (odd, considering the "dragon" the mythical Perseus slew was a sea monster) and doesn't do Perseus any harm unless he attacks it first. It's invincible for most of the game, but in the end it goes down really fast. Most of the screenshots here are from very early in the game so you can see all the different monsters still alive, but Perseus actually gathers a lot of items on his quest. Some are just specimen of the different creatures, others like the jar and the bow look like tools, even though nothing can be done with them. (And a bow would have been so useful!) The trophies also include four women... well, it WAS the '80s. Oh, my! Has it really almost been a year since I've posted the first episode? 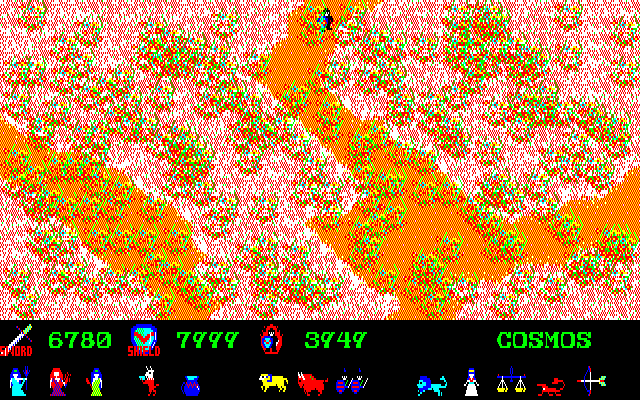 Well, circumstances have prevented me from continuing with these for much too long, but I actually played this game back around the time when I wrote about Das Erbe, so my memory might be a bit hazy about specifics this time, sorry about that. We're getting political this time! This was actually the adventure that brought me to covering advertisement games - last year we had elections in Germany, and leading up to them, Captain Gysi's face could be seen in the streets quite a lot (there, I missed my chance to be topical for once), which reminded me of his game, and in search for it I stumbled upon the fantastic Werbespiel-Archiv site, where I got this and other games. The game was commissioneed by the German PDS (Party of Democratic Socialists), and Gregor Gysi was their top candidate at the time. In the intro, Commander Kohl (chancellor at the time) has steered the space ship Bonn dangerously close to a black hole. His course of action? Landing the ship on an asteroid, putting everyone in stasis and waiting until the problem solves itself (a criticism often put up by the left against the real Helmut Kohl in his later years as chancellor in the '90s). So it's up to Captain Gysi to set a new course for the spaceship! Yes, subtlety is not this game's strength, but at least it's funny. In the stasis room, he meets Kinkelstein, a small walking rock with a hat, who blindly follows whoever's in charge (he's based on Klaus Kinkel, whose party, the FDP had served as coalition partner to both left and right governments in the decades prior) and thus becomes Gysi's companion and manages his inventory. After getting out of the stasis room by fishing a key out of the commander's suit and unlocking the door, Captain Gysi steps into the elevator room. The game now suddenly gets really hard because of a bug: It's necessary to go down the corridoor to the right, but something's wrong with the hotspot - it's almost impossible to find, especially if you don't know that you need to go there. This leads into the Merkelarium, where he meets the Commander's servant and his main antagonist, a recorder flute. This may seem random and nonsensical, but behind that lies sharp political commentary: Before the unification, Merkel (who as you've probably heard made quite a career a few years later) used to be a member of the East German CDU, whose old members were referred to as Blockflöten (of course a play on the Bloc, but the word actually means recorder flute). Merkel had distanced herself publicly from that old-DDR faction, but the implication here is that she might not have been as far removed from them as she claimed. After dealing with the flute through some clever rhetoric (the dialogs run automatically), Gysi can get the commander's coat, which is enough to fool his unflexible guard bot Blümel (CDU politician Norbert Blüm). Most of the puzzles rely on silly puns to (German) political jargon. Here is a tax hole blocking your way, but Captain Gysi can fill it with a tax coin he found earlier. On the bridge we meet the flute again, and a reserve brain in the back. But we send her away in a bubble and can move freely around the bridge. But we need the Master Key Card to change the course! This is the arsenal. It's not possible to take any of the space suits, but Captain Gysi pockets the 1000 ton bomb (of course) and the Napoleon hat. Gysi doesn't want to walk past because he doesn't want to get wet, but he can put a napoleon head he just found on him to make him shrink. With the "Social Hammock" (another political term describing the state's wellfare support of supposedly unproductive individuals) we can get up the broken stairs to the computer room. The animation of the Kinkelstein growing wings and flying along is pretty neat. If my remember correctly, the frog is actually not a politician, but TV personality/producer Alfred Biolek, who's in this game just because the last part of his name sounds like "lick" in German, so Gysi can give him a lollipop to lick and turn him back into a human, because he's blocking the data highway by sitting on a cable. Makes sense, doesn't it? The flute is also there again to annoy us, but she can be easily flung off screen using a rubber paragraph (actually a term for a piece of legislation whose vague phrasing is open to very differing interpretation) and a portable fan to cut it. That gives access to the computer, but I completely forgot what I did there. I do remember, though, that it was full of useless, time-wasting options. For some reason there is a machine that turns everything that falls through it red. Gysi's uniform goes back to normal after a short while, but he can also throw in this sock, which is needed later. 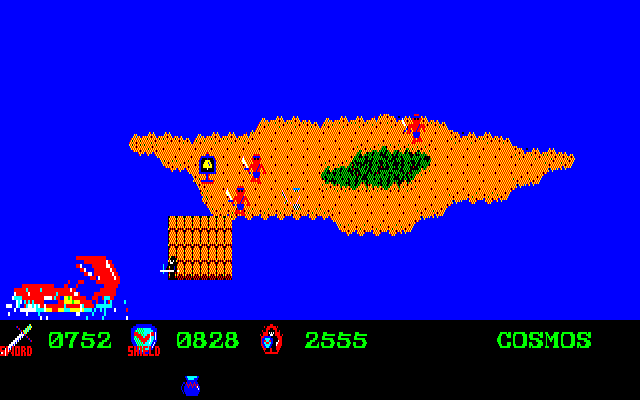 ... the view switches to a mini game where the player has to shoot invading ears(!) by clicking on them. WTactualF!? 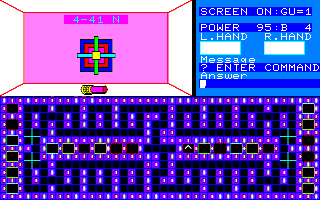 Somehow all of this gives access to the commander's safe and a key card (don't remember the specifics of this, sorry). ... putting the red sock on his head. This grants us the master keycard, and now we can finally go to the bridge and set a new course. Taking them out is easy: Just open the battery lit on the flute (what does a flute need a battery for? ), take out the battery and watch it fall and crush the brain. Setting course to Galaxis Futura... which is actually the title of the sequel, which boasted high res graphics and speech! The game once again can be found at the Werbespiel-Archiv. I might yet cover the sequel eventually, but if you don't want to wait another year for me to get to it, you can try it yourself here. Greetings! 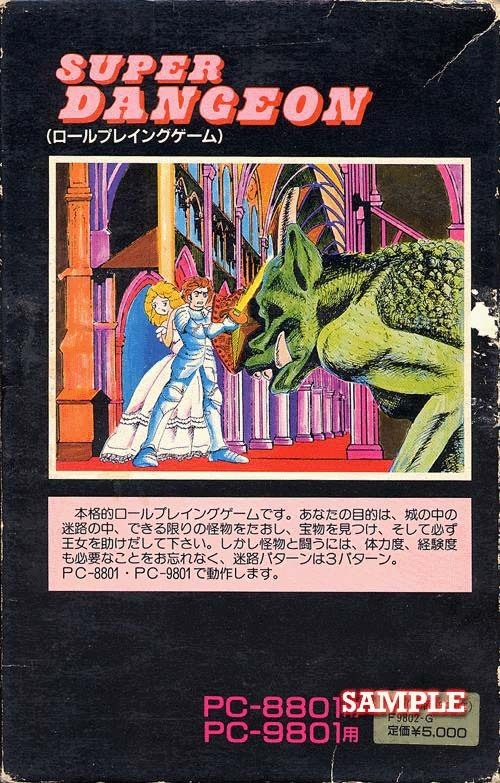 The above is actually the cover for Dragon and Princess, which we already wrote about, but we couldn't find a cover scan back then. Well, here it is. This was supposedly a very early game we've missed before. As the numeral implies, it was meant as the start to a whole series depicting the live of the famous-infamous warlord Tokugawa. This first episode deals with his youth, but it's easy to see that it doesn't take things strictly historical and young Ieyasu fights monsters made out of extended text characters. 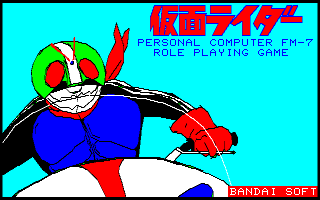 Apparently there was a second part, which was more of a strategy game, reflecting Tokugawa's rise as a warlord, but that seems even more obscure than this RPG. 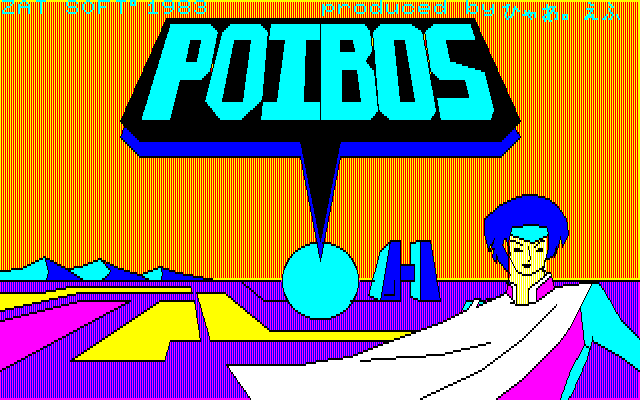 Poibos Part 1 - there never was a part 2 - is notable for probably being Japan's first RPG in a SciFi setting. The advertisement clearly channels Star Wars. The tiny graphics window doesn't betray much of the setting, though. 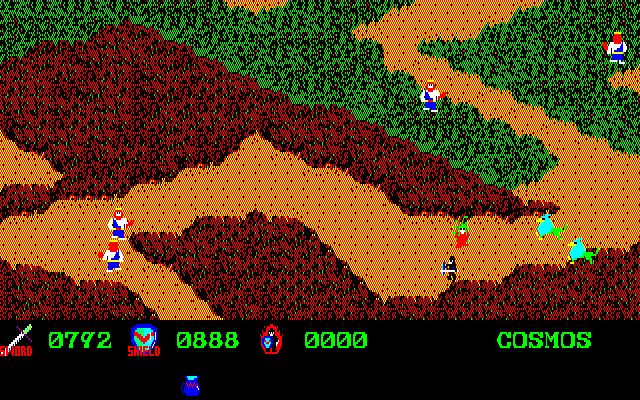 In case that isn't clear from the very minimalistic graphics, it shows a top-down view of a planet surface, where the player (the hero starts out alone but apparently can recruit companions later) can move around freely. Every few steps occurs a random encounter, which offers some options, but always seems to result in a fight or the player's escape. The odds are stacked severely against the player, however, and it seems impossible to survive more than two encounters. Without any apparent means to heal or find companions before dying, this has turned into a very short trip. 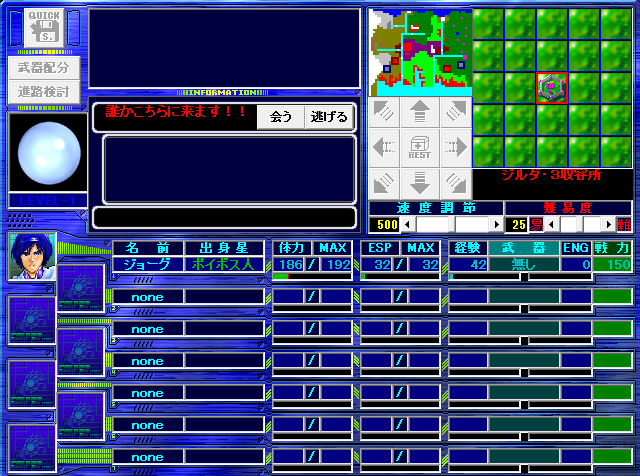 Around the turn of the millennium, there was actually a fan remake of Poibos Part 1, which offers a glimpse of hope in the form of selectable difficulty levels, but since it was made A) for a Japanese OS and B) old versions of Windows, it reliably crashed upon every single encounter during testing. 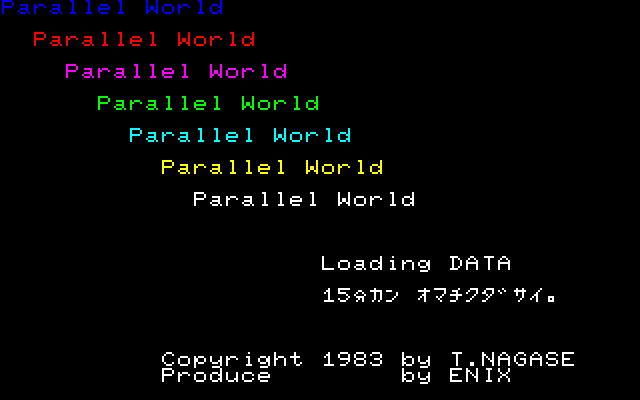 Parallel World is notable as the first RPG published by Enix, although the later Dragon Quest crew had nothing to do with it. 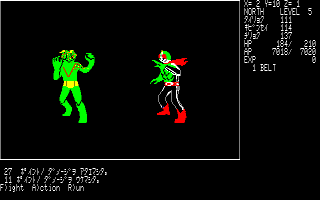 It's also about the only RPG that was first programmed for the Sharp X1, which among Japanese computer enthusiasts was more known for its arcade ports. 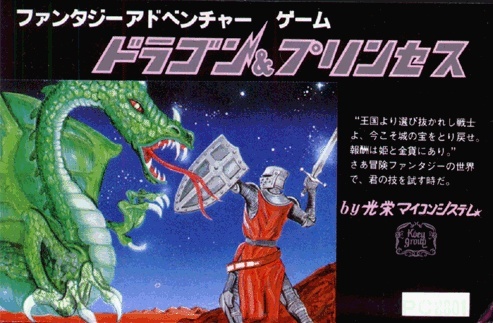 It was programmed by one Toshiyuki Nagase, and the back of the box advertises it as "A true role-playing game with 26 verbs, 100 characters, 10 monster types, 20 types of food, 26 swords, 26 crystals, 21 dungeons and 100 ilnesses", where the player would travel between 7 parallel worlds. 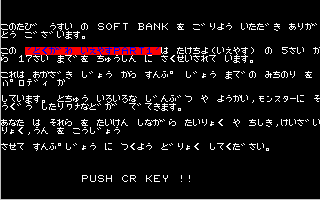 A tape image of the PC-88 version could actually be found, but in the only emulator that supports tape image files, it crashes right after the title screen (which contains the hilarious message: "Loading Data. Please wait 15 minutes"). 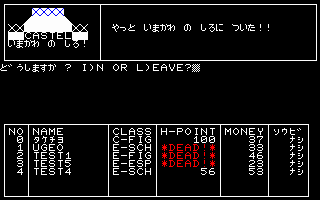 Bounded by the little known Nihon Micom seems like a more typical fantasy RPG, once again mostly using a text-adventure like interface with just a tiny graphics window. We could never find a disk image of it, so there's not much else to say. The screenshots below say they come from a "vol. 2", but we got no clue what that actually means, as the Japanese databases only seem to list this one title. 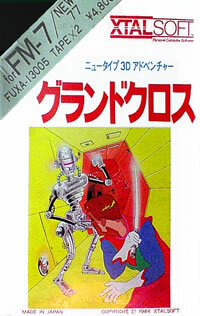 Published by Fuji Onkyou RAM (yes, we've never heard of them, either), the hilariously misspelled title is a wireframe dungeon crawler. Once again, that's all we've got. 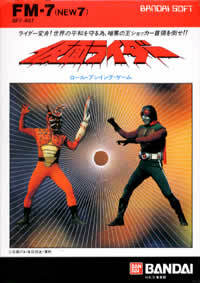 Kamen Rider of course is based on the seminal tokusatsu show. 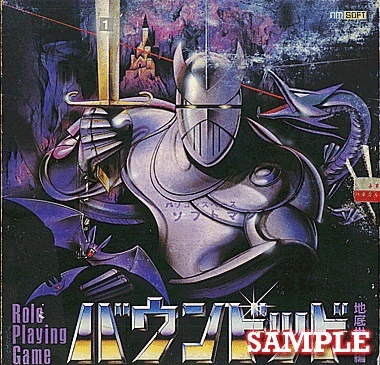 The game tie-in by Bandai seems to have been a rather typical dungeon crawler, but with huge sprites showing the hero and his enemies fighting.